The Team: I watch a ton of MLS, and that is the most lively I have seen Beckham look in years! 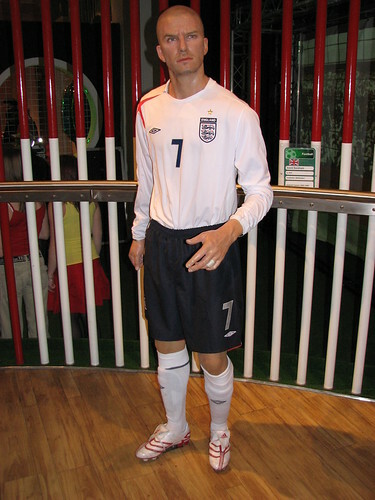 All kidding aside, it is no secret that Yanks like myself do not care much for Becks or England’s “football” team. I am not sure why, as England has one of the most entertaining teams in the world. It probably goes all the way back to 1950, or even 1776, who knows? I do know that England’s play in the last half dozen or so World Cups has been pretty bloody terrible. The Cream: England’s starting eleven must be considered one of the best in the world, and their bench is certainly one of the deepest. I expect the following lads to shine under the spotlight in South Africa: Wayne Rooney (the top shelf striker), John Terry (the Captain), Lamps & Gerrard (the misfits in the middle), and Theo Walcott (the young gun). I bet Becks makes the roster, but plays sparingly. Ironically, he is too old to bring back the spirit of 1966. The Dream: Can England live up to the enormous hype? I don’t think so. They play too tight I think, and Capello doesn’t espouse a loose style. It’s been 60 years since the Miracle on Grass, and I think the US beats England in the 2010 World Cup. I believe the final score will be 1-0. But what do I know about real “football” anyways, I am just a freaking Yank. I still think England advances and makes it farther than US, but they won’t win it all. I put their odds at 8-1.